This species is accepted, and its native range is China (SW. Gansu, Sichuan). Abies recurvata is rated as Vulnerable (VU) according to IUCN Red List criteria and has received a EDGE score of -1.58, which places it in position 480 on the EDGE Gymnosperm list. It has a Evolutionary Distinctiveness of 51.44, ranked 822. More information on the EDGE Gymnosperm project here https://www.edgeofexistence.org. Shao, Y.Z. & Xiang, Q.P. (2015). 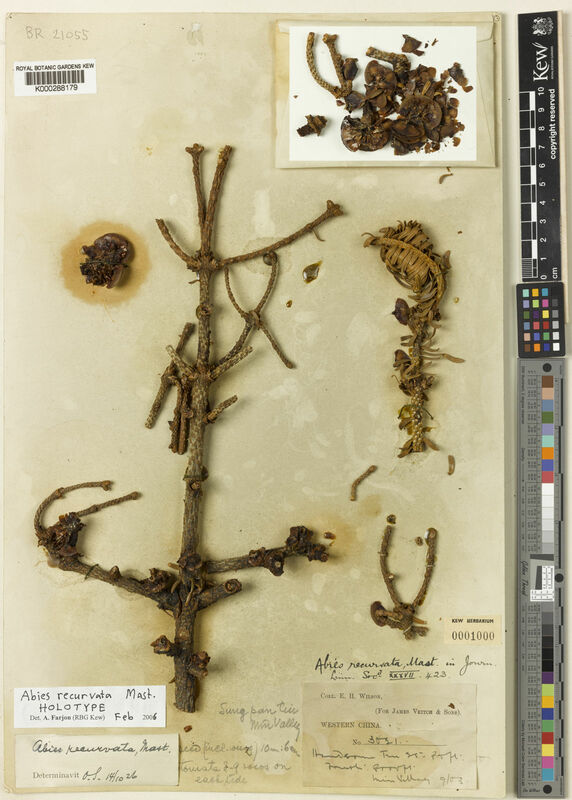 Species delimitation and phylogeography of the Abies chensiensis complex inferred from morphological and molecular data Botanical Journal of the Linnean Society 177: 175-188.